Don't let the heathland designation fool you, Bull Bay Golf Club, on the Isle of Anglesey, is as enjoyable as any links golf course in Wales. Sea views and tough plays makes Bull Bay a must-visit. BULL BAY, Wales - For some members of a links golf club or for the links-starved tourist players of North America, "parkland" or "heathland" is almost a four-letter word. But thanks to Bull Bay Golf Club on the Isle of Anglesey, it shouldn't be if you're planning your North Wales golf trip. This 19th century gem, designed by legendary Herbert Fowler of golf designs "Golden Age," is a classic heathland - though it possesses a lot of links qualities. It's as enjoyable as any links course in Wales, and should be grouped into any North Wales golf trip itinerary, right up there with Nefyn & District Golf Club, Aberdovey Golf Club and Royal St. David's Golf Club. 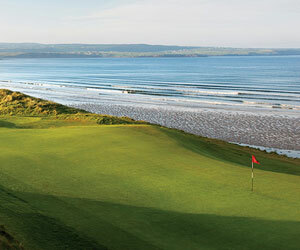 Visually, it has more sea views than most links courses themselves, thanks to its lofty perch just off the coastline. This also means the wind is as prevalent here as any coastal links. The golf course hosted the Ryder Cup Wales 2010 Welsh Open Young PGA Professional Championship in April, where a record number of entries for the tournament competed and battled the usual heavy winds. The golf course is a modest 6,276 yards and a par 70. But as with any worthy historic course in the United Kingdom, defends itself both with the elements and with some design trickery. You're certain to be caught off guard on a few instances with some blind shots and visual deception. The par-4 second hole plays uphill and over a fenced-in dirt road. The par-4 seventh, on the other hand, plays downhill to a fairway you can't see from the tee. From here, it's back uphill, and if your tee shot is on the left side, it must carry an old stone shed. There are plenty of down-and-ups throughout the course, making for tremendous shot variety. Visually, you're never going to feel like you've seen the same hole twice, though overpowering gorse is always in the back of your mind, as it encroaches many landing zones and greens. But the most exhilarating view is saved for last. The long par-4 18th hole is a splendid finish, the kind of hole most clubs in the world would love to have as their closer. A relatively generous fairway that lets you swing away off the tee tumbles downhill towards the clubhouse, while blue sea envelopes the backdrop. Bull Bay is a real knock-out heathland golf course on the island of Anglessey that takes you on a roller coaster ride up and down through beautiful island hillside. This course is no easy task, and the wind is seldom tame, but it possesses great hole variety and shot values demanding enough for a pro event and the coastal scenery that will please any amateur visitor to Wales. Fowler built this course shortly after his most famous creation, Walton Heath Golf Club in England, and it's easy to see he was on his "A-game" here. Though Bull Bay may be tough on your handicap, it's very easy on the wallet. Green fees are £30-£40. If you're planning on spending more time on the Isle, consider the Isle's package where you can book five rounds for £79, which is about half off regular green fees. You can play any combination of five courses for this rate. Information on this package is available at VisitAnglesey.com. If you choose to stay on the Isle of Anglesey, the Tre-ysgawan Hall Country House Hotel & Spa (tel: 01248 750750) is a four-star retreat with a full-service spa and fine dining set in a 19th century country house. Its grounds are beautifully manicured for long walks, and the golf courses of Angelsey are all nearby. Guest rooms are traditional in decor, though they feature plenty of modern amenities including a whirlpool and bath. The Four Poster suites are especially spacious and classically appointed.